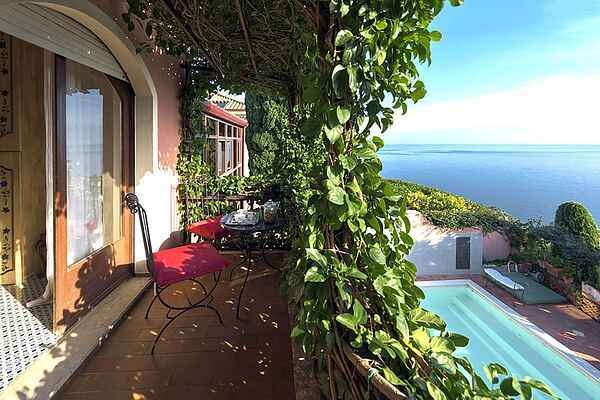 Exclusive villa with private swimming pool in Taormina. Refined and prestigious, this splendid property is situated in close proximity to the Greek Theatre and to Corso Umberto, but also to a wealth of smart boutiques, restaurants and clubs that are in Taorminas centre. Overlooking the garden and the pool, villa La Boheme offers several equipped areas which are ideal for outdoor living. Elegantly furnished with great attention to detail, this villa features a beautiful Sicilian style décor with ancient ceramics and antique furniture pieces. Spread over two levels, the villa comfortable interiors include on the ground floor a bedroom with an en-suite bathroom and a large living area with sitting room with TV, lounge with big screen and projector, study, dining room, kitchen and guest bathroom. From the living room two staircases lead to the first floor where there are four romantic bedrooms and four bathrooms. All rooms have air conditioning. The villa comes also with Wi-Fi, satellite TV, washing machine, dishwasher and central heating. From the property can be reached in a few minutes drive or by cable car the close beaches of Mazzarò and Isola Bella. Catania, the villages on the slopes of Mount Etna, the Alcantara Gorges and the seaside villages on the Cyclops Riviera are a short drive away. Etna - Linguaglossa 28 km; Messina 50 km; Siracusa 120 km; Catania 52 km; Taormina 600 m; Sea 4 km; Catania Airport 70 km.